Randomized clinical trials (RCTs) stopped early for benefit often receive great attention and affect clinical practice, but pose interpretational challenges for clinicians, researchers, and policy makers. Because the decision to stop the trial may arise from catching the treatment effect at a random high, truncated RCTs (tRCTs) may overestimate the true treatment effect. The St udy O f Trial P olicy Of I nterim T runcation (STOPIT-1), which systematically reviewed the epidemiology and reporting quality of tRCTs, found that such trials are becoming more common, but that reporting of stopping rules and decisions were often deficient. Most importantly, treatment effects were often implausibly large and inversely related to the number of the events accrued. The aim of STOPIT-2 is to determine the magnitude and determinants of possible bias introduced by stopping RCTs early for benefit. We will use sensitive strategies to search for systematic reviews addressing the same clinical question as each of the tRCTs identified in STOPIT-1 and in a subsequent literature search. We will check all RCTs included in each systematic review to determine their similarity to the index tRCT in terms of participants, interventions, and outcome definition, and conduct new meta-analyses addressing the outcome that led to early termination of the tRCT. For each pair of tRCT and systematic review of corresponding non-tRCTs we will estimate the ratio of relative risks, and hence estimate the degree of bias. We will use hierarchical multivariable regression to determine the factors associated with the magnitude of this ratio. Factors explored will include the presence and quality of a stopping rule, the methodological quality of the trials, and the number of total events that had occurred at the time of truncation. Finally, we will evaluate whether Bayesian methods using conservative informative priors to "regress to the mean" overoptimistic tRCTs can correct observed biases. A better understanding of the extent to which tRCTs exaggerate treatment effects and of the factors associated with the magnitude of this bias can optimize trial design and data monitoring charters, and may aid in the interpretation of the results from trials stopped early for benefit. Interim analyses conducted early in the course of a randomized clinical trial (RCTs) may suggest larger than expected treatment effects that are inconsistent with chance. Consequently, investigators and data monitoring committees may conclude that one treatment is superior to the other and decide to stop the trial and release the results, arguing that completing the trial as planned is unadvisable or even unethical. The publicity surrounding such action often captures considerable attention because of the large treatment effects and the dramatic nature of the decision to terminate early. The extent to which tRCTs actually overestimate effects, the magnitude of bias, and the factors associated (and perhaps causally related) with the magnitude of bias in individual situations, remain uncertain. If one could identify a comprehensive set of trials not stopped early that addressed the same question as a tRCT, those trials or all trials (including the tRCT) could provide a least biased assessment of the true treatment effect that the corresponding tRCT (or tRCTs if there were more than one addressing the same question) was trying to estimate. The goal of this project is to obtain such a comprehensive set of trials matching a number of tRCTs, and thus address the question of magnitude of bias, and variables associated with the magnitude of bias. What is the extent to which tRCTs overestimate the treatment effect compared with the best available estimate of treatment effect as determined by a systematic review and meta-analysis of RCTs addressing the same question as the tRCT? What factors are associated with the size of the observed difference in the treatment effect between the tRCT and the respective meta-analytic estimate? Can Bayesian methods, using conservative priors, provide more likely estimates of the true underlying treatment effect, i.e. somehow "correct" for truncation bias? 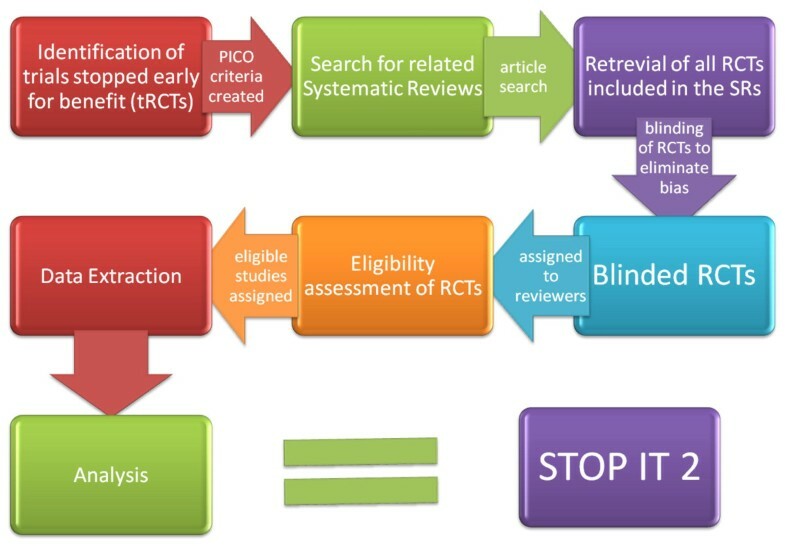 In STOPIT-2, we will search for systematic reviews addressing the same question as the tRCTs (Figure 1). We will utilize the sensitive strategy for systematic reviews put forth for MEDLINE by Montori et al Systematic reviews that ask a similar question to the tRCT but do not include the tRCT due to its publication after the search date of the systematic reviews will be updated to the present time. Other systematic reviews that include the tRCT will not be updated. Systematic reviews that are only similar under the broadest of definitions will be included only if the review authors chose to pool the tRCT within the systematic review. Flow chart of the Study of Trial Policy of Interim Truncation (STOPIT)-2. Abbreviations: RCT, randomized clinical trial; tRCT, truncated randomized trial due to stopping early for benefit; PICO, patient population, intervention, control, outcome. From each eligible systematic review we will blind each RCT's results and two independent reviewers will determine eligibility. From each eligible trial we will then extract data and conduct new meta-analyses addressing the outcome that led to the early termination of the tRCT(s). First, we will compare the relative risk generated by the tRCT with the relative risk from all non-truncated studies. Second we will use multivariable regression to determine the factors associated with the difference in magnitude of effect between the tRCTs and RCTs not stopped early. These factors will include the presence and quality of a stopping rule, the methodological quality of the trials, and the number of events that had occurred at the time of truncation. Finally, we will compare possible methods for correcting the treatment effect estimates from tRCTs, in particular the use of Bayesian methods using conservative informative priors to "regress to the mean" the tRCT estimates. We will then compare the degree of disagreement with the meta-analytical estimates between the Bayesian-adjusted tRCT and the unadjusted tRCT results. Some authors have suggested that pooling tRCTs with non-truncated trials addressing the same question will yield minimally biased estimates of treatment effects[7, 8] However, our previous empirical finding that stopped-early studies contributed more than 40% of the weight in more than a third of meta-analyses including tRCTs challenges this view) Nevertheless, if the overall estimate of treatment effect (based on all studies, including tRCTs) were the least biased estimate of the true underlying effect, it is this estimate to which one should compare tRCTs. Based on simulations and theoretical considerations we found compelling strengths and compelling limitations for each approach (Table 1). We will explore the extent to which results are consistent with the hypothesis that the pooled estimate including the tRCTs is least biased using our empirical data (for instance, the tRCTs should provide a relatively small weight in the meta-analysis as a result of their having fewer events because of stopping early). Choosing a primary analysis for a study commonly involves some arbitrariness. Given compelling reasons for either approach, we decided to conduct both analyses. We chose non-truncated RCTs only as the comparator in our primary analysis. In a complementary second analysis, we will compare the tRCT and the pooled estimate of all trials including the tRCT. Comparison of non-truncated RCTs only and truncated + non-truncated RCTs as comparators to estimate the magnitude of bias associated with stopping clinical trials early for benefit based on simulations and theoretical considerations. For meta-analyses, we will search the Cochrane Database of Systematic Reviews and the Database of Abstracts of Reviews of Effects using the population and intervention of the tRCTs as search terms. We will also search for meta-analyses in MEDLINE with textwords and Medical Subject Heading terms based on the study population and the intervention specified in the research question of the tRCTs, if necessary supplemented by a specified outcome, and with textwords "meta-analysis" OR "overview" OR "systematic review" and in a second approach with limits "meta-analysis.pt." AND "human"
Because there is considerable judgment involved in the eligibility decisions, particularly criteria 3 to 5, every decision of the initial adjudicators will be reviewed and confirmed or refuted by another adjudicator and if necessary, by a third party. If in doubt while applying the broadest similarity criteria, a key factor for eligibility will be that the systematic review pooled the tRCT. In general, if in doubt, we will judge the systematic review eligible, because there will be a second review of eligibility at the level of individual trials. The only systematic reviews we will update are those that did not include the index tRCT(s) because they were completed prior to the publication of the tRCT. In these instances, we will update the search of the systematic reviews to the present using the same strategy used in the systematic review. We will not update all meta-analyses in the systematic reviews, only the ones for the outcomes that led to the early termination of the matching tRCT(s). One could have criteria for similarity that are very strict, or very permissive. As it is uncertain what the right approach is, we will classify the population, intervention, control and outcome of each potentially eligible trial as either "more or less identical", "similar, but not identical" or "broadly similar". The eligibility form will allow differentiation between eligibility of the studies based on the narrow, the broad or the broadest criteria and the "closeness" of the RCTs to the index tRCT will be considered in the analyses. We will construct a number of teams of two reviewers to make the eligibility decisions. Each team will include individuals with expertise relevant to the content of the studies they will review. Within each pair of reviewers, the rating of the individual RCTs will be done independently and in duplicate. Disagreements will be resolved by discussion and, if necessary, by a third party. Because we are at risk of bias in the decision about whether to include a RCT based on the results, the reviewers who judge eligibility will be blinded to the results of the trial. Blinding will be accomplished by a separate team, not involved in study selection, using black ink on "hard copies" before these are scanned into electronic format or using black boxes overlaid on the sections describing results on electronic versions in portable document format of the paper. Every section of potentially eligible RCTs that reports the magnitude of results (abstract, results and discussion) will be blinded before the decision on eligibility is made. Blinding will be tested in a random set of 20 papers sent to 20 reviewers to ensure its success. For RCTs, disagreements in relation to similarity of 2 levels or greater will require adjudication. Disagreements in relation to similarity of 1 level will not and the broader similarity rating will be assumed correct (Figure 2). Example to illustrate the process of judging similarity between a randomized clinical trial and the corresponding truncated randomized clinical trial. Level 1 = Meets narrow criteria; Level 2 = Meets broad criteria; Level 3 = Meets broadest criteria; Level 4 = Does not meet criteria. * For differences in reviewer ratings of 1 level we will consider the broader similarity rating for the overall rating. ** Differences in reviewer ratings of 2 levels or greater will require adjudication by a third reviewer. From each RCT, we will collect the following data in duplicate. We will calculate relative risks for each RCT in our study. For studies that provide results as continuous data (means, standard deviations), we will estimate an approximate dichotomous equivalent. To do this we will assume normal distributions of the results and that half a standard deviation represents the minimal important change Using baseline data we will obtain the 0.5 standard deviation threshold from the baseline distribution and calculate the proportion of each follow-up distribution above or below (depending on the direction of the outcome) the threshold, i.e. the proportion of patients in each treatment arm who "did worse". This will allow us to specify relative risks and associated confidence intervals. If baseline data are not available, we will use the follow-up distribution of the control group to substitute for the 0.5 standard deviation threshold. As well, for each meta-analysis we will calculate the pooled relative risk and 95% confidence interval for all trials that were not stopped early. Where there is more than one tRCT per meta-analysis we will also calculate a pooled relative risk and confidence interval for those tRCTs. These pooled estimates of relative risks will be calculated using an inverse variance weighted random effects model. We will graphically present the results in a scatterplot of the effect size (relative risk) of the tRCT (horizontal axis) against the pooled effect size of non-tRCTs (vertical axis). If the tRCT and non-tRCTs give similar results, the points should be scattered along the diagonal of the scatterplot; if the tRCTs overestimate treatment effects they should be found above the diagonal. We will plot the log(ratio of relative risks) and calculate an overall log(ratio of relative risks) as an inverse variance-weighted average of the log(ratio of relative risks). These will be back transformed and the ratio of relative risk values will be plotted for presentational purposes. To investigate possible predictors of treatment effect sizes in RCTs, we will perform a hierarchical (multi-level) regression analysis. Our model will have two levels: individual RCT (study) level and meta-analysis level. The dependent variable in this analysis will be the logarithm of the relative risk (logRR) for each study and we will investigate the associations of the logRR with characteristics of the individual studies. We will investigate five possible predictors. Our main predictor of interest is a variable that we will construct from two different study characteristics, the presence and quality of a stopping rule and whether or not the RCT was truncated early. The rule for stopping early will be categorized as one of three possibilities: (i) a rigorous rule (published prior to the trial plan), (ii) a not-so-rigorous rule such as ad hoc rules developed during the trial, (iii) no rule or unknown. Each of these three possibilities will be combined with whether or not the trial stopped early, creating 6 categories in total. It is very likely that there will be less than six categories in our final analysis as it is quite conceivable that some of the scenarios will not occur. We will carry out post hoc comparisons of outcomes between these 6 groups, focusing on contrasts that highlight the effects of the rule and the "truncated study" variable, and their interaction, to the extent that the available data permit. Other study-level characteristics that we will examine are the methodological quality (blinding of patients, care-givers, and outcome assessors, and allocation concealment), and the total number of events. At the meta-analysis level, the only variable in the model will be an indicator of the specific meta-analyses to which each study belongs. We will look at the main effects of all the variables and the interaction between the rule/truncated variable and the other predictor variables. Each study will yield a summary statistic (logRR) and an associated variance. The variance will provide weights for a meta-regression to evaluate the determinants of the estimated treatment effect. The multivariable regression described above will be performed on 5 different datasets based on different levels of a variable which we will call closeness. This variable will measure how similar the non-truncated trials in each meta-analysis are to the corresponding truncated trial(s) with regard to the a) patient population, b) treatment arm, c) control arm and d) outcome. For each of these four, we will categorize closeness into one of three levels: very close (termed as 'fits the narrow criteria' in the database), moderately close (termed as 'fits the broad criteria' in the database), and less close (termed as 'fits the broadest criteria' in the database). This judgement will be coded by 2 reviewers, and the level of agreement (kappa) checked. Each trial will then be categorized by its least close category over the four areas which we will use to define our 5 different datasets. The datasets will be: 1) only trials that are "very close" in all domains; 2) trials with one or more "moderately close" domain, but no "less close" domains and not "very close" in all domains; 3) trials that are "less close" in at least one domain; 4) trials that are "very close" or "moderately close" in all domains (corresponds to 1) and 2) combined); and 5) all trials. As discussed previously, we will conduct a further analysis in which the comparison is between the tRCT and the pooled estimate of all trials including the tRCT. If the tRCTs provide relatively small weights in the meta-analyses as a result of fewer events because of stopping early, the pooled estimate including the tRCTs may provide the least biased summary estimate. Finally, we will compare possible methods for correcting the estimates from tRCTs for possible bias, in particular the use of Bayesian methods. The basic approach here is to use a conservative prior for trials (derived empirically from past trials in other areas – we will review such existing reviews [11–13]) and combine this information with the data from the tRCT to obtain a posterior estimate of effect. The weight will depend on the relative variance of the conservative prior and the tRCT: small trials will lead to an emphasis on the conservative prior whereas large trials will attach relatively greater importance to the observed data. We will calculate such Bayesian relative risks for each tRCT in our study. As for the simple tRCT estimate, we will graphically present the results for a visual comparison of the effect size (relative risk) of the truncated RCT(s) and the non-truncated RCTs. Based on previous simulation work  we would predict that the Bayesian estimates obtained will be closer to the meta-analysis findings. The results of STOPIT-2 will extend earlier modeling studies and a systematic review of trials stopped early to provide a precise estimate of the extent of that bias as it plays out in the real world. Estimating the extent of bias and factors associated with the magnitude of bias will have implications for the design, conduct, and reporting of future clinical trials. We will use sensitive search strategies to identify systematic reviews corresponding to tRCTs, and will undertake a labor-intensive process of judging eligibility of several thousand individual RCTs, each being assessed independently by two reviewers blinded to the RCT results. The blinding of trials prior to review is a particular strength of this study, limiting the potential for biased eligibility assessment on the basis of the magnitude of effect of the studies. The accuracy of our results depends on the comprehensive search of the systematic reviews we will include. We have set a relatively low threshold for inclusion of corresponding systematic reviews: that the review included a methods section and that the systematic search included at least MEDLINE. Publication bias threatens all systematic reviews, and many do not include a thorough search for unpublished trials. To the extent that publication bias exists, however, it will likely lead to overestimates of the effects found in the pooled non-truncated RCTs. We assume that publication bias is less likely to affect the tRCTs. Thus, we anticipate that publication bias will yield an underestimate of the upward bias of the tRCTs relative to the non-tRCTs, and hence that our estimate of bias associated with truncation is likely to be conservative. Despite objective criteria, when assessing the methodological quality of RCTs we are limited by the quality of the reporting of the trials. A further strength of the study is the planned hierarchical analysis in which we link the estimates of treatment effect from tRCTs and non-tRCTs addressing the same question. Since the extent to which studies address the same question is a matter of judgment, the provision for a sensitivity analysis based on similarity of question will further strengthen the results. The results of this study may have a profound effect on the decision-making of data monitoring committees Data monitoring committees have an ethical obligation to ensure patients are offered effective treatment as soon as it is clear that an effective treatment is indeed available. To many people, this mandates a stopping rule that will ensure that any trial that shows an apparently large treatment effect at an early stage does not continue beyond a certain point. Data monitoring committees also have, however, an ethical obligation to future patients, who require precise and accurate data addressing patient-important outcomes to make optimal treatment choices. While there is growing awareness that stopping trials early for apparent benefit may lead to overestimated results, little is known about the magnitude and the determinants of bias that truncation introduces. The results of STOPIT-2 will provide valuable guidance to investigators, institutional review boards, funding agencies, and data monitoring committees regarding appropriate use of stopping rules in clinical trials. The results of STOPIT-2 will impact on numerous issues of public interest. Investigators, patients and their advocates, institutional review boards, and funding agencies may have different but convergent interests in stopping a study as soon as an important difference between experimental and control group emerges. Increased impact and publicity may motivate investigators, journals, and funding agents. A commitment to promptly offer participants in the less favorable arm the better treatment choice may motivate investigators, patients and their advocates, and data monitoring committees. The opportunity to save research dollars by truncating a trial may motivate the funding agencies. Empirical evidence of the magnitude and determinants of bias that truncation introduces will ensure that investigators, editors, authors of meta-analyses and guideline panels become appropriately cautious in their interpretation of stopped early trials. Ultimately, this will reduce the risk of prematurely translating unreliable study findings into clinical practice. The findings of STOPIT-2 will influence recommendations on how to design and conduct RCTs and meta-analyses, and how to report their results, as summarized in the CONSORT  and QUOROM  guidelines. The results of the proposed study will also have implications for systematic reviews, including those who publish in the Cochrane Library. Grading the strength of recommendations and quality of evidence in clinical guidelines will also be influenced by the findings of STOPIT-2 Given the increasing frequency with which trials are stopped early, the results of STOPIT-2 will be of interest to numerous stakeholders including patients and their physicians, investigators, research ethics boards, funding agencies, journal editors, and policy makers. Patient population, intervention, control, outcome. We thank Amanda Bedard, Monica Owen, Michelle Murray, Shelley Anderson, and Deborah Maddock for their administrative assistance. We are grateful to Ratchada Kitsommart and Chusak Okascharoen for their help with blinding of articles, and Luma Muhtadie, Kayi Li, and Amandeep Rai for their help with the literature search. The study is funded by the British Medical Research Council. The funding agency had no role in the study design, in the writing of the manuscript, or in the decision to submit this or future manuscripts for publication. Matthias Briel is supported by a scholarship for advanced researchers from the Swiss National Science Foundation (PASMA-112951/1) and the Roche Research Foundation. Heiner C. Bucher, Alain J. Nordmann, Regina Kunz, and Heike Raatz are supported by grants from Santésuisse and the Gottfried and Julia Bangerter-Rhyner-Foundation. All listed authors contributed to the design of this protocol.